I often use labyrinths in my retreats and workshops, and until now I’ve either used what’s available onsite, or I’ve created them with string, mowed them into grass, or made them out of dried leaves. This weekend, I finally made a portable labyrinth that I can carry with me. 2. I wanted to make my labyrinth approximately 20′ x 20′, so I bought 5 drop cloths and sewed them together. They’re hemmed along the long edges, and at first I was going to seam-rip all of the hems, but that was far too tedious, so I just cut off the hems (losing a bit of the width, but I was okay with that) and sewed them. 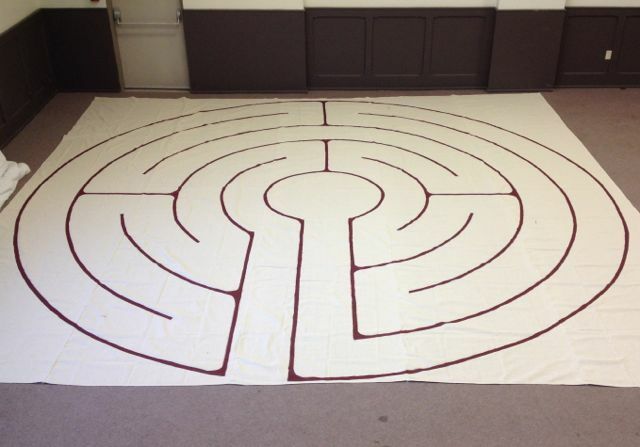 Tip: I had access to a large space for my labyrinth creation (a church floor), and I recommend doing the sewing in a fairly large space too. It’s bulky and a little awkward. 3. Once the dropcloths were sewn together, I drew the outline of the labyrinth with chalk. 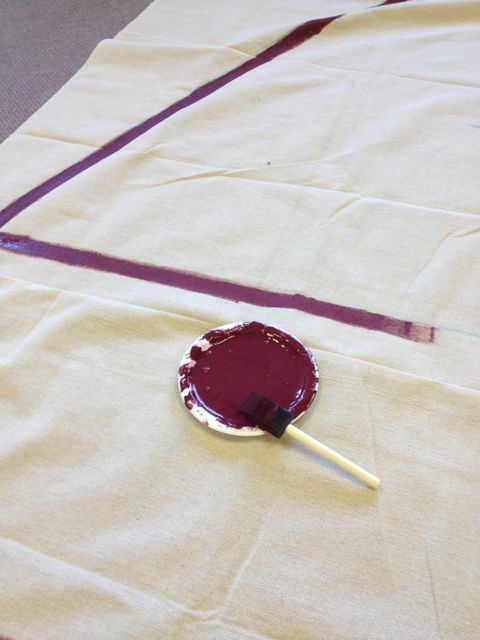 I started by measuring where my centre was and making a chalk mark there. Then I placed a paint can at the centre and tied a long string loosely on it to use as a giant compass/protractor. Tip: Make sure the string is loose enough on the can so that it rotates as you move around the circle. 4. I wanted to make a 5-path version of the Chartres labyrinth. To figure out how wide my paths should be, I started by making the largest circle (to within a couple of inches of the edge of the canvas) and then making the centre circle (large enough that three people can comfortably stand in it). Then I measured the distance between the centre circle and the outside circle and divided it by 5. It came to 17.5 inches. 5. 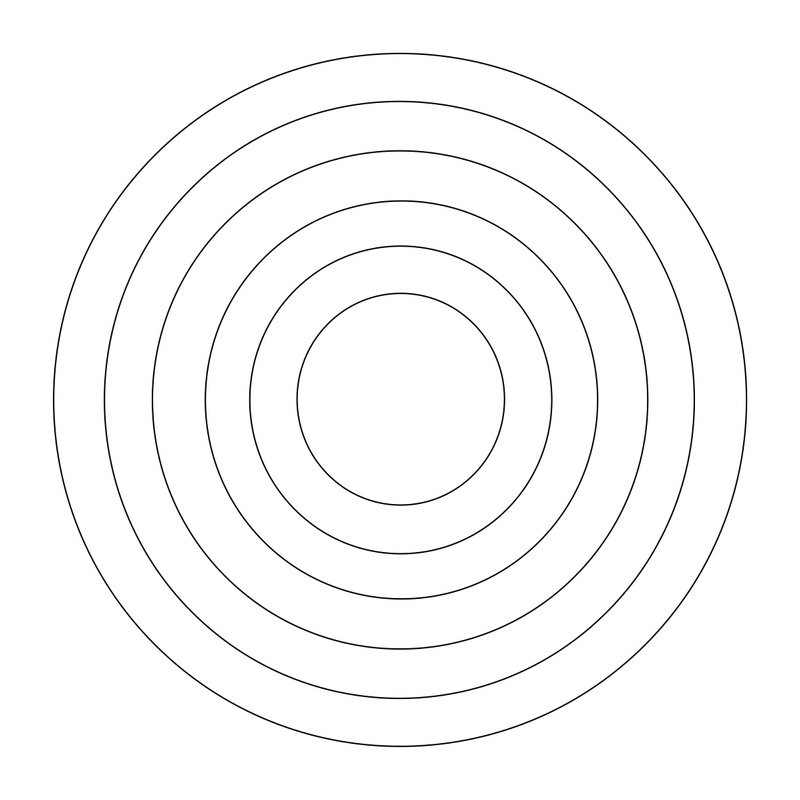 Shortening my string each time, I drew the concentric circles. 6. From there, it’s a matter of drawing the horizontal and vertical lines and then erasing the parts of the circle that aren’t needed. 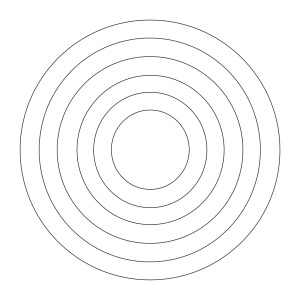 As you’ll see in the design I used, the horizontal and vertical lines all connect circles, so you need to pay attention to which of the circles you’re connecting, and then measure the same width as your path (17.5″ in my case) from that line to know how much of the circle to erase. 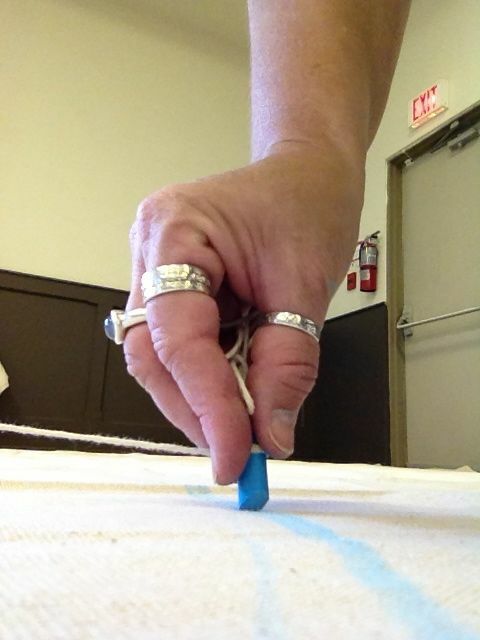 Tip: The chalk marks are easy to brush away with a household brush (I used a pot scrubber). 7. Once I had the chalk lines in place, I started painting. To keep it inexpensive, I used some leftover acrylic house paint for my lines, which worked great. I painted on the inside of each chalk line to keep it consistent. 8. For the width of the lines, I simply painted as wide as a small sponge brush. The edges of my lines are not very precise, since it’s hard to attain precision on fabric without driving yourself crazy, but I decided I was fine with that. It might have worked to put painters tape down, but that seemed like a lot of extra work to me (and I only had the space for a limited time) and I wasn’t sure how the tape would work around circles. 9. After the paint had dried, I decided to touch up the edges a bit with a thinner brush. It took a fair bit of extra time, but I liked the more solid line, so it was worth it. 10. I let it dry for about 12 hours before folding it. It might have been a good idea to leave it longer, but the space was being used the next day so I needed to move it. The hardest part of the whole process was all of the time spent (about 8 hours) crouching on the floor. By the end of it, I had a hard time unfolding my body! Stretching during my breaks helped, but I could have been more diligent. In November I’ll be speaking about labyrinths at a conference and will use my new portable labyrinth for the first time. I’ll share pictures at that time. 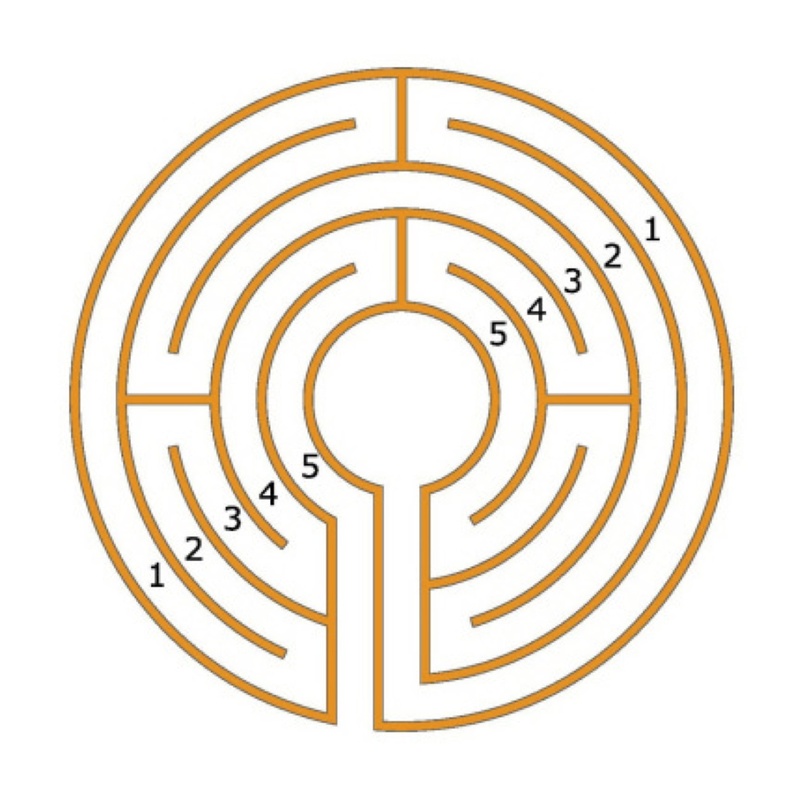 If you’d like to learn more about labyrinths, I’m hosting a free call on Lessons from the Labyrinth on Tuesday, October 21st. (It will be recorded, so if you can’t make it, sign up anyway and I’ll send a link.) It will give you some general information about labyrinths and what they’ve taught me, and will also serve as an introduction to my new course The Spiral Path: A Woman’s Journey to Herself, which starts on November 1st. Thankyou! 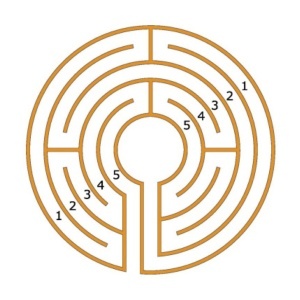 Have seen the Chartres labyrinth and am inspired! I.d like to receive a link for listening to what you recorded about lessons from the labyrinth on 21-10. I’ve been making smaller labyrinths like this for several years now. 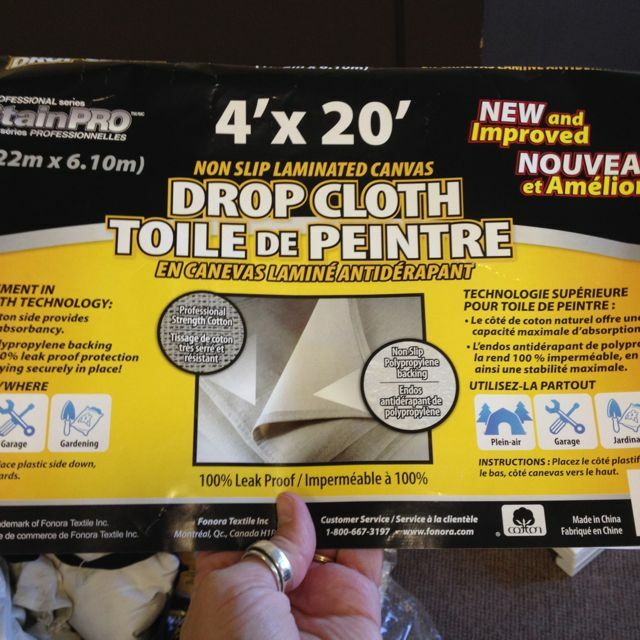 I generally purchase the 12′ X 15′ size (about $35-$40 and no sewing!) and have purchased 15 X 20 on-line for about $120 (again, no sewing). The website I use also sells circular covers for baseball pitching mounds as small as 20′ and in many different colors. They are a bit more expensive, but are coated in plastic, so are waterproof. Here’s the link to the 15X20 size, click the items on the left that are baseball tarps…there is also a round tarp section I’ve not investigated as they are PVC. You can also get 12 X 15 at local hardware stores (Home Depot, Lowes, etc.). For most facilities, you can always find a room that will easily hold this size. You can walk 6 – 8 on it easily. When painting you do need to put down a cheap plastic dropcloth underneath to catch any paint that soaks through the canvas. I use the same basic technic, although I bought a vertical papertowel holder that sits on a base and a 15# lifting weight that had a center hole the same size as the papertowel spindle. I use this for my Compass center. I got both at Goodwill for a few dollars. I found that the Shur-line trim and touchup pads made a better line than the foam brushes (althought they are a tad bigger than 1″ wide). They are a bit stiffer and don’t tend to smash out of shape as easy. And once you buy the handle, you can buy refills for the pad. I’m willing to send photos of the “tools” I’ve made and use if anyone is interested. You can email me at lorette.waggoner@gmail.com. I am so happy I found this! I have had the drop cloth sitting around for months but I had no idea how to go about the drawing. I’m making a simple version for kids yoga classes. We usually arrange yoga mats for our “meditation maze” but this will take less prep in the middle of class. Thank you for the tips and motivation! Hello Heather, I have a question about how the acrylic has lasted over time. 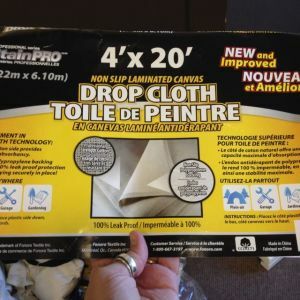 I’m about to try this with a heavy weight canvas and I’m curious how the paint will handle being on a fabric that gets folded or rolled up. Thanks!